Listen to some of the new songs I've recently recorded. This is a song that I wrote for my mother two years before her passing in 2010. 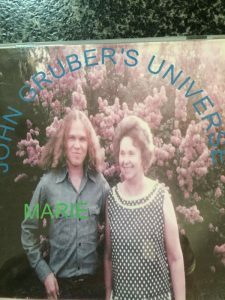 John Gruber approaches blues the way a folk singer would, which is to say that it's not gut-wrenching in any obvious kind of way-it's more subdued and tender. Or, to put it another way, rather than wearing his heart on his sleeve, it's resting comfortably in his jacket's front pocket. Yet his folky presentation makes it no less emotional. I challenge anyone to call Woody Guthrie a man without passion. What makes Gruber's blues songs interesting is how often they steer into other musical territory; There's some rock' n' roll, folk and pop, but the blues still dominate. It is the framework of his sound.